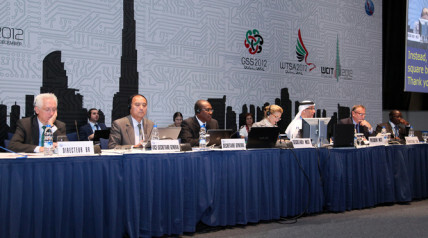 After 11 days of discussion and debate about the future of the internet, the World Conference on International Telecommunications (WCIT) in Dubai appears to have collapsed. On the meeting’s penultimate day, talks broke down, with delegates from the US and UK (and other countries) refusing to sign a revised version of the International Telecommunications Regulations (ITR) treaty – the main focus of the conference. Our fundamental view is that the internet needs to be free and open. [The internet] does best when it’s not regulated, when it’s left alone to innovate, when people are free to communicate, to do commerce etcetera. So [our]main message is don’t tamper with the internet. It is unlikely you’ll find a lot of people who would disagree with this statement of principle. In fact the whole focus of public attention on the WCIT has been in the context of the protection of “internet freedom”. We’re not able to sign a bad agreement that does nobody any favours and makes nobody happy. So with the WCIT spluttering to a close, what do we have to take away from the process? Has the “free and open” nature of the internet really been compromised? As an article on technology law blog TechnoLlama points out, there has been very little attention focused on what “internet freedom” actually means and why WCIT and the International Telecommunications Union (ITU) are perceived as a threat to this freedom. This is particularly the case when there is already a range of bodies who could (and do) exert serious levels of control over aspects of the internet including: access, domain names, content filtering and monitoring of traffic. These very bodies – the Internet Engineering Task Force (IETF), World Wide Web Consortium (W3C), and the Internet Corporation for Assigned Names and Numbers (ICANN) – are noted by Kramer as exemplars of the best environments in which to discuss matters of internet governance. Given local control of the internet can and does already happen, proposals at WCIT that domestic regulators be given greater control over internet regulation – proposals attributed to countries including Russia, the UAE and China – are virtually meaningless. They already have the capacity to exercise controls – such as the regulation of internet content in Australia by ACMA – so protests, campaigns and DDoS attacks do not minimise the likelihood of this happening. During the WCIT debate became heavily bogged down on a number of technical issues. The issue here is whether this provision should be interpreted to apply to the internet. If so it would disturb the control over internet names and numbers currently exercised by ICANN and the Internet Assigned Numbers Authority (IANA). Such arguments may have caused us to lose sight of the actual purpose and potential outcomes of WCIT – i.e to update the ITR to apply to current communication technology, particularly in the area of convergences between telephony and internet. So as we wait to see whether the final scheduled day of the conference will actually go ahead, my major observation is that the WCIT is a strangely archaic mechanism for discussing issues relating to the internet. Why are we still flying government delegates from around the world to a meeting in Dubai? Why are the majority of those meetings – which involve people making statements such as “free and open is good” – happening behind closed doors and considering documents that are kept secret unless leaked? The very nature of these kinds of meetings encourages suspicion and cynicism about potential outcomes, regardless of whether that suspicion is warranted (that said, there was a webcast of the plenary proceedings and some of the other sessions). If we really want to talk about internet freedom, and I believe we should, we need to get the right issues on the table. We also need to acknowledge that the internet isn’t free now, in many ways, and if we want it to be, we need to look at what our own domestic governments are already doing. Melissa de Zwart does not work for, consult to, own shares in or receive funding from any company or organisation that would benefit from this article, and has no relevant affiliations.